ARIS help during an SAP project? Process-Driven SAP Management Solution is a combination of tools, content and methodology supporting all the main SAP project types you encounter and that in all phases from strategy, to testing and running of the SAP solution. 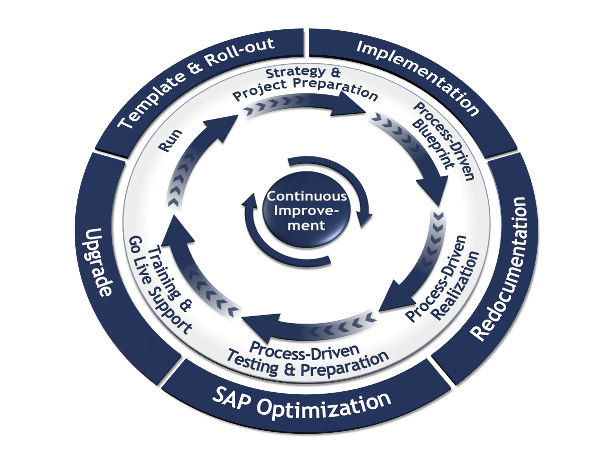 The Process-Driven SAP lifecycle describes the different SAP project types you can find in companies: Implementation, Redocumentation, Optimization, Upgrade and Template & Roll-out. It also depicts the project lifecycle: Strategy & project preparation phase, Process-Driven Blueprint, Process-Driven Realization, Process-Driven Testing and Preparation, Training & Go-Live Support and Run (Monitoring & Optimization). With process-driven SAP management, you can leverage IT assets and reduce total cost of ownership as well through reducing upgrade and implementation project times drastically and simplifying customizing based on business process requirements.